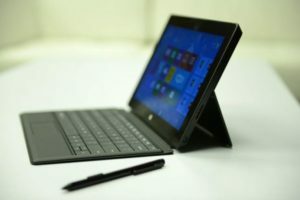 Microsoft has been quiet on the Surface Tablet Pro, a version of the on-market Surface RT tablet that raises the bar on specs to an Intel Core i5 processor, a 1,920 × 1,080-pixel HD touchscreen, an included active-stylus, and a more robust offering of ports. Today the company demoed the Surface Tablet Pro in all the performance glory of its Intel processor, and we enjoyed the device’s smooth, quick-footed navigation, support for Windows apps, and capable collection of new bonus features — especially considering it costs $400 more than the $499 Surface RT. True to previous details, the Surface Pro is running with a current-gen Intel Core i5 x86 processor assisted by integrated 4000 graphics, not the Surface RT’s Nvidia Tegra 3 ARM-based chip. As expected the new chip translated a bump in performance, especially while gaming and using graphics intensive software on a display that ups the pixel density from 1,366 × 768 to 1,920 × 1,080-pixels. We noted in our Surface RT review the app stalls and loading delays we encountered on that device. We didn’t put the Surface Pro through such stringent paces today, but the interface certainly looked smoother on the familiar 10.6-inch display. The Pro’s ports include a USB 3.0 (up from a USB 2.0 on Surface RT) and a Mini DisplayPort jack for connection to monitors with up to the 2,560 × 1,440 resolution. During a quick run of killshots in the first-person Xbox shooter BulletStorm, the screen fragged through the level with ease and was as responsive to gaming controls as any PC. The device also transferred a few 36-MP RAW and JPEG photos from a Nikon D800 camera in about two seconds, though we noticed it took about five seconds for the Surface Pro to read the camera’s SD card and populate the full shot library. The coolest part of the demo involved connected the upcoming slate to a monitor with a max resolution of 2,560 × 1,600 pixels. The device first mirrored its desktop to the monitor in the same 1080p resolution, then cloned the desktop to its maximum pixel output of 2,660 × 1,440. In that mode, Microsoft refs executed a couple neat tricks: some BulletStorm action, moving around a cube in a 3D rendering app, and playing around in a drawing app–all totally smooth, seamless, and stutter-free. The mention of drawing apps brings us to two things. First is the fact that, with Intel Core i5 inside, the Pro can support the long, long history of existing Windows apps in the tablet’s desktop mode, making it a better tool for hard-core Windows users who need access to the OS’s full history of software, none of which (save Office) is supported on the ARM-powered Surface RT. Second, the Surface Pro includes an active stylus with pressure sensitivity, a right-click button, and palm-lock capability so thorough even the Surface’s home button is deactivated when the pen’s tip hovers near the display. Just like the Surface’s charger, the stylus is magnetized to the slate’s power port, which means if you’re charging the tablet, the pen can’t be docked. While the Surface Pro was connected to that 2,560 × 1,600-pixel monitor in clone mode, Microsoft actually used the tablet like a Wacom device. That is, the rep touched the stylus to the Surface’s touchscreen and navigated Windows 8 on the monitor. Even though the tablet’s max res is 1080p, the system automatically adjusted the scale of touch navigation to match the larger 1440p output on the monitor (not to mention the detail of the natural-looking paper texture in the Fresh Paint app looked pretty boss). Cool stuff. Of course, the caveats of the Surface Pro are a little obvious. Sure, it starts at $899, but that might not be too bad considering the Intel performance boost, improved resolution, support for legacy Windows apps, included stylus, USB 3.0, and better A/V output. The big ding comes in the form of something we can’t measure until we fully review the Surface Pro, and that’s battery life. Intel chips are big power draws. Although Microsoft worked in a 4.5 watt-hour battery , according to the Surface team, the slate will offer about half the life of the Surface RT, which lasted close to 8 hours on the LAPTOP Mag Battery Test (which uses continuous surfing over Wi-Fi). Plus the inclusion of a larger battery and an Intel processor not only makes the Surface Pro heavier than the RT, it makes it hotter, leading Microsoft to include two CPU fans and add a ventilation system that runs along the device’s edge. The fans hummed quietly even after a few minutes of shoot-’em-up gaming. Of course, all that new stuff also thickens the tablet from .37 to .58 inches, and it also pushes the weight to a noticeably heavier 2 pounds (up from 1.4 on the RT). But hey, with more power comes more responsibility, right? Upticks in performance and functionality (pen input, app support, and USB 3.0) don’t always come with sacrifices in tablets, but they do for the Surface Pro. We’ll have to determine the balance of that win-lose matrix when the Surface lands in our lab. Till then, the Surface Pro, while heavier, shorter of juice, and more expensive than the RT, looks to be a sharp, capable, and fast Windows 8 slate. Learn how to configure Windows 8 into the LAN/WAN environment, attend the http://www.cedsolutions.com/938/training/microsoft-course-20687 course.